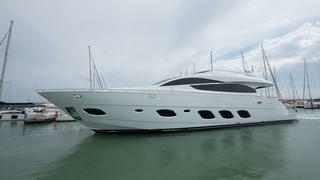 The first hull in the Filippetti F93 superyacht series has been launched in Fano, Italy. Styled inside and out by Fulvio De Simoni, this 28.3 metre Filippetti Yacht features all-GRP construction and a fast planing hull. Following the launch, the first F93 will now undergo sea trials before being delivered to her North American owner. Filippetti commented that this was a highly customised project, with the client specifying a retractable davit crane, which can be fully integrated into the deck furniture when not in use. Key features in the cockpit include a retractable TV cabinet and a bar area with five white leather stools by yacht interior design brand Poltrona Frau of Milan. A foredeck seating area with a bimini shade completes the exterior relaxation spaces. Interior décor includes Zebrawood lacquered cabinetry, oak parquet flooring, white leather and lighting design by Cantalupi, while the dark grey glazing contrasts with the white metallic hull finish. Accommodation for eight is split between four cabins, including an amidships master suite. The owner chose to customise each cabin with subtle nuances and each cabin’s distinctive tones are picked up by the shower room’s mosaic tiling. Back aft, the crew quarters allow accommodation for a staff of three, while the superyacht tender garage has enough room for a four-metre RIB and three Jet Skis. Power comes from a pair of MTU diesel engines, twinned with Arneson surface drives for a top speed of 31 knots and a fast cruising speed of 25 knots. Upcoming launches at the Italian yard include a 35.40 metre Filipetti flagship. The Filipetti Navetta 35 is currently under construction after it was sold last summer.